We are a group of new and old players who are passionate about tabletop roleplaying games. Here you can learn a little about your favorite cast member. 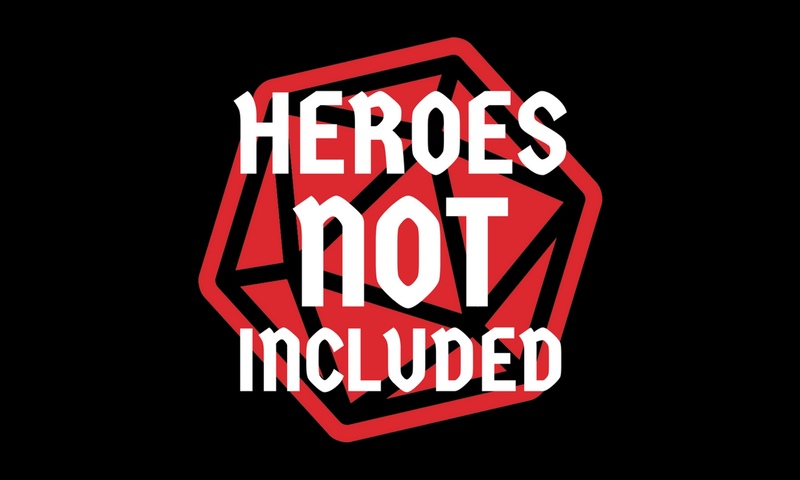 The creator, producer, and writer of Heroes Not Included, Quinn Sowers (@sowersian) is an avid CCG player, gamer, tabletop games enthusiast, and a writer who has been playing and running roleplaying games in the Pacific Northwest for over 30 years. It all began when TSR released the 3rd edition of their Dungeons & Dragons Basic Set in 1979. When most kids their age were chasing after crushes, they spent endless hours leaning over a table covered in strange dice, cryptic sheets of paper, pewter figures, and dustings of snack food crumbs. Not only did discovering roleplaying games help them overcome their dyslexia, the games proved to be the spark that ignited a lifelong love of storytelling and adventure. Nothing in their life has been left untouched by this love for roleplaying games. Over the years, they have played everything from FASA’s Star Trek RPG to Pondsmith’s Cyberpunk 2020 published by R. Talsorian Games to Siembieda’s RIFTS and the classic Star Wars RPG from West End Games. But through it all “the original fantasy roleplaying game,” in all its incarnations, has remained the touchstone. Richie Hazlewood stumbled onto tabletop roleplaying in sixth grade when a kid on the bus invited him to make a character for Advanced Dungeons & Dragons 2nd Edition. He had never played a game like this before. By the end of the first session, he was hooked. He has been looking for good opportunities to play ever since. A fan of fantasy and science fiction, Richie has no real experience in acting or entertainment but loves arguing his way out of situations, which seems to lend itself to roleplaying. One thing Richie enjoys most about roleplaying is the humor that often comes out in playing. Some of hardest times he has ever laughed was when a group inevitably found themselves trying the most unorthodox and ridiculous schemes to solve a problem. Any phrase that starts with, “Okay. So just try and imagine,” makes him eager to hear what comes next. Zakaria Zajac is a software developer by day and a game-oholic by night. As a former stage actor, Zak has done everything from musicals to dinner theater. Roleplaying gives him the opportunity to put his acting skills to use and explore his imagination. Zak played Dungeons & Dragons 3rd edition by Wizards of the Coast back in high school for a few years before taking a long hiatus. During that time, he developed a passion for digital roleplaying games, including Everquest by Sony Online Entertainment and Worlds of Warcraft by Blizzard Entertainment. For the past two years, he has played Dungeons and Dragons 5th edition and Star Wars Edge of the Empire from Fantasy Flight Games with this awesome group, using his great sense of humor and his many talents to make every episode fun. Josh first started playing Dungeons & Dragons with the Advanced release in the early 1980s. Patrons have a had a chance to listen to Josh’s wonderful characters for over the past six months as he has been a special guest on our patron only podcast series playing through Tales From The Loop and Eclipse Phase. There is rarely a moment at the table when Josh doesn’t leverage his considerable roleplaying experience to bring dynamic and entertaining characters to life. An avid gamer, Josh can often be found playing a variety of tabletop and video games in his spare time. For the past year, he has been playing with Quinn and the rest of the new cast through the Tales of the Yawning Portal. Amy Traut is the new baby of the group! The world of D&D had been a mystery to her until 2016 when Greyson invited her to join a campaign with Quinn. Playing through Tales from the Yawning Portal, her life was changed forever. Her first character was a half-orc monk named Lig. Amy is a Seattle native with a background in visual arts. She enjoys taking advantage of any opportunity to make little aspects of the campaign come to life. She also binds a book for every new character she plays. A chandler by day, she loves spending lots of time with her cat and a good book. Chayne Fetters makes his living as a coffee roaster but delves into his passion for tabletop gaming as much as he can. His love for gaming extends beyond playing his favorite games as he is designing both board games and a roleplaying system in his spare time. Coming from an artistic background, he enjoys exploring the vast and imaginative worlds of Dungeons & Dragons through art and play. Chayne started playing D&D as a teen with his brother, working through arduous and silly home brewed campaigns. After working with Greyson, they became fast friends and started playing with Quinn and the rest of the cast for over a year now. He enjoys creating characters that are both peculiar yet endearing, offering humor and dishing out damage along the way. Assisting with production of the podcast as our editor, Greyson Simon (@Legend0fGreyson) is a chandler, a cat-parent, and the founder of the Transgender Language Primer, a community-run guide to the language of gender, sexuality, accessibility, and acceptance. Aside from a brief foray into a Dungeons & Dragons 4th edition Starter Kit with their dad, Greyson has only been playing since 2010. Played mostly on the floor of their tiny studio apartment and outside the laundromat while in college, their first character was a half-elf swashbuckler named Phinn in a solo adventure using the Pathfinder Roleplaying Game by Paizo Publishing. Since joining the group 3 years ago, Greyson has spent most weekends at the table playing straight man to everyone’s goofs or cooking up some under-appreciated puns of their own. They are notorious for creating well rounded characters to fill in the gaps that often occur in small parties and love bringing new folks to the table. They eagerly await the release of the Eberron setting for 5th edition.